All religions say they teach truth, and many claim that belonging to their particular organization is essential for salvation. Likewise, the Watchtower Society says they alone teach truth and are the only organization by which a person can receive salvation. Strong emphasis on Bible doctrine is used to “prove” what they teach is correct. Jesus statement at John 13:35 – “By this all will know that YOU are my disciples, if YOU have love among yourselves” – is pointed to, and it can be shown that Jehovah’s Witnesses belong to a loving organisation. Up until the 1950’s, Witnesses worshipped Jesus. In 1954, the Watchtower said it was wrong to worship Jesus, so they all stopped worshipping him. Before 1954 a person could be disfellowshipped if they didn’t worship Jesus; after they were disfellowshipped if they did! Bible truth had not changed so either before or after 1954 Jehovah’s Witnesses were not following bible truth. It was not Gods Spirit that created this important discrepancy; it was the leaders of the organization. To be classified as a Jehovahs Witness following truth was not important, following the incorrect teachings of men was. God is a God of truth (Ex 34:6). If this organization was not teaching truth, either before or after the 1950s, then it was not Spirit directed. Its members were not following Gods truth, they were following the untruths of men. The underlying premise to being a Jehovah’s Witness is that the Watchtower Society is God’s visible organization. Everything hinges around this concept. Prove that the Watchtower Society is God’s Organization and it does not matter if doctrines change or practices are wrong because it must be God’s will to reveal things in his own time. Prove that the Watchtower Society is not God’s Organization and it becomes irrelevant if the doctrines are correct or not. To know whether Jehovah’s Witnesses have the truth only requires being able to prove or disprove this premise. Once this is understood, it becomes easy to test the validity of such a claim. There are a several things to consider when determining if the Watchtower Society, a corporation started in 1879 in the United States of America, is God’s Organization. To start, it is necessary to understand where the claim comes from. The Watchtower teaches that the Slave is represented by its leaders, its Governing Body. The parable of an appointed slave is the only Scriptural support the Watchtower Society has that following its Governing Body is a requirement of salvation in the Last Days. However, Matthew 24:45 is a vague parable that does not mention the word Organization, Watchtower, Governing Body or Jehovah’s Witness. In fact the word Organization and term Governing Body never appear in the Bible. For this reason the parable is applied differently by various religions. The reason a Jehovah’s Witness is supposed to believe the Watchtower Society is God’s only true organization is because they were supplying the right sort of food, the truth, when Jesus inspected the organization in 1919. The only significant doctrinal change introduced during this period – that the earthly resurrection would start in 1925 – was a false and embarrassing failure. Are these teachings the “right sort of food at the proper time”? By current Watchtower truth, the food the Watchtower Society was providing in 1919 was filled with inaccurate prophecy, spiritism, paganism, polytheism, idolatry and political activism. Certainly anyone belonging to such a religion could not be considered one of the anointed. It brings into question if Russell, who had died in 1916, could be in heaven. Did Jesus go about immediately cleansing his organization between 1914 and 1919? No! The reality is that virtually no teachings or Babylonish practices were changed during this period. All of the above teachings were still being promoted in 1925. In fact, the understanding of 1914 was not changed until 1943 in ”The Truth Shall Make You Free” and the (so called) idolatry of Jesus continued until after 1950. Can you imagine Jesus pronouncing the slave clean and then allowing them to worship the wrong God for the next 30 years? 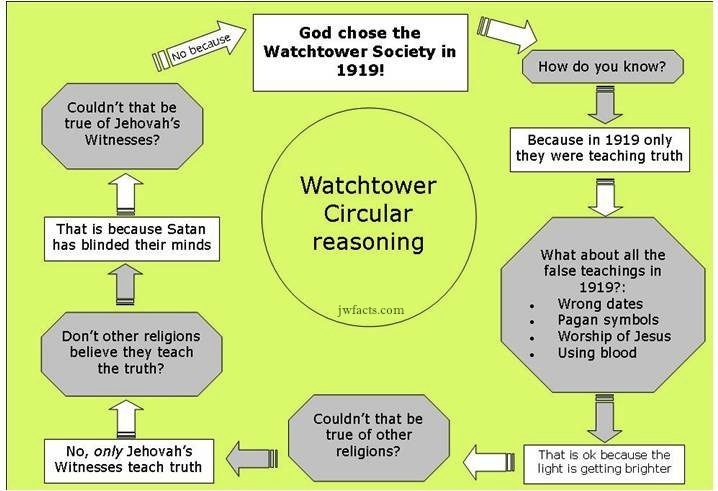 There is still a religious group that follows Watchtower teachings as they were in 1919 – Bible Students. If Bible Students were found to be spiritually clean in 1919, then Bible Students today must still be considered acceptable to Jehovah. In fact, Bible Students are closer to the 1919 teachings than Jehovah’s Witnesses are. Between 1916 and 1932, with Rutherford’s dramatic and often incorrect overhaul of Russell’s doctrine, around three quarters of all Bible Students separated and formed their own organisations. Bible Students to this day reject the Trinity, immortal soul and hell-fire, and believe we are living in Christ’s presence. The above information briefly shows that any claim about Jesus choosing the Watchtower Society as his organization in 1919 has no basis. The Watchtower Society carried many false teachings as part of the religion until Rutherford made significant changes in the late 1920s, and has continued changing teachings ever since. Why is a Witness convinced that no one else worships God? This is due to the effects of constant indoctrination, as described at Mind Control. When confronted with this information the mind of a Jehovah’s Witness will immediately raise the thought-stopping question “If it is not the truth where else will I go?” and of course they know of no other place. Such a dilemma causes the mind to suffer what is referred to as cognitive dissonance. It is safer mentally to refuse to consider the implications of such inconsistencies of belief than to confront them. If a person confronts these inconsistencies and realises what they believe is wrong, they are faced with accepting that many years of their life may have been spent in pointless pursuits and are left not knowing what to do next. This is a common dilemma for members of many high control groups. To shut down clear thinking, four thought-stopping concepts, common amongst high control groups, are used. You need to overcome each of these false concepts to see through Watchtower dogma successfully. Only the Watchtower has taught truth since 1919. But since 1919 there have been numerous, significant doctrinal changes. That is an excuse to justify prior falsehood. If the Watchtower can use this, so can every religion. The question is not “where” but “whom”. Sadly, the last hurdle is most difficult of all. Fear is so ingrained that for years after leaving, former Witnesses may still suffer panic about dying at Armageddon. Even more real is the pain suffered by shunning from family and friends on leaving the Organization. There is no easy way to avoid this, which is why cognitive dissonance results. With the Watchtower Society no longer stipulating your beliefs in areas as disparate as theology, morals and your view of the historical past, present and future the mind grasps for a new reference point. It parallels very well with the philosophical question posed in the movie The Matrix written by Andy & Larry Wachowski. For many people it is easier to take the figurative blue pill and think no further as to whether what they believe is truth. A second premise used by the Watchtower Society is that their light gets brighter. This enables Jehovah’s Witnesses put aside any doubts and allows them to feel that it is unnecessary to deal with any inconsistencies that occurred in the past or are still apparent now. Rather than accept that the many wrong dates and changed teachings indicate the organization is not directed by God, it is explained away as progressive enlightenment. This concept of provisional infallibility, that is; the Watchtower is to be considered the voice of God (w57 6/15 p.370) even though it has regularly been wrong, is illogical when examined but satisfies the minds need for stability. Viewing the history of Watchtower doctrine, complete with all that was wrong and that has changed back and forth multiple times brings one to the understanding that Holy Spirit does not direct the Watchtower teachings. The same is true in regard to the appointment of brothers as well as the disfellowshipping of wrongdoers, which are also said to be done under the guidance of the Holy Spirit. Since Witnesses are at times appointed to positions of authority whilst engaging in gross sin, it is readily apparent that Holy Spirit is not guiding the Watchtower Organisation in this area either. Once a person is ready to accept that the Watchtower Society has made significant mistakes, that in 1919 it was not found to be dispensing the proper food and is not an Organisation directed by God’s holy spirit, the questions arise; ”How could I be so sure it was the truth? Aren’t the doctrines correct, or at least isn’t this religion the closest to truth?” To understand why you were so sure, it is interesting to review the article on fear and mind control. By dishonestly adding the word Jehovah to the New Testament, the Society gives false importance to this word. More damaging spiritually is to notice the number of times that the Organization is implicated in place of Jesus, including that Jesus is not Mediator for the “Other Sheep” of Jehovahs Witnesses, but just for the leaders. One word of caution. People that come out of one high control group are often attracted to similar groups and can quickly become ensnared in the same situation they have just left. You have plenty of time. There is no need to make a hasty decision in regards to leaving the Watchtower Society or joining another religion. Big warning saingl!!! The watchtower and Jehovah’s Witnesses do not lead you to the truth. GOD leads you to the truth through the Holy Spirit. That is the Holy Spirits job. Pray before you study on your own to get to the truth. God is capable to lead even a person stranded in the wilderness with only the Bible as a companion. Trust God, not any one church. I have studied with JW as well as many other sections of Christianity. I have recently been moved to be with Seventh Day Adventists. They encourage you to study on your own as well as attend the church. They are the closest to what the Bible actually teaches. One of the reasons I stopped studying with JW is because the Bible clearly shows that with God your burden should be light. I notice they have very rigid idea’s about going door to door. Once you are a member, you are required to do a certain amount of hours. It seems many of them were not happy. It appeared as though their god increased the burden on the every day person. SDA teaches LOVE above all things. Most of them practice what they preach. I have always felt loved at the church that I attend. They also do not make me feel like an outcast because I have not been able to get rid of my addictions yet. They continue to treat me as one of the family. They don’t normally push for cash (They do take a collection but they believe God will put it in your heart to give.) Since God is Love, shouldn’t his group of followers show that in their everyday life? Look at these two scriptures and remember what day is the seventh. It is Saturday.Exodus 20:8-11 (One of the ten commandments)andMatthew 5: 17-18 (What Jesus says about the Commandments- they are still important) It’s so simple but because of people’s stubborn belief in their pastors and clergy . they miss it. Study on your own for a while and if you want to return to study with someone later, That is fine. Just make sure you use only the Bible to lead you to truth. (Cross check everything that is said by the Bible) If it isn’t in the Bible, don’t accept is as truth from God.